The Tempo Control pane of DP's main transport window is where you can switch your sequence over to Conductor Track control, to start exploiting some of the tempo-related powers of the program. If you favour the feel of music that results from real people playing real instruments, the strict-tempo approach of a sequencer can feel like a straitjacket. But DP offers many ways of breaking out, and this month we explore them, as well as bringing news of the major update that is Digital Performer 5. These days we're used to hearing heavily produced music recorded to a strict, unchanging click. The resulting, somewhat mechanical, quality is a key feature of many dance music styles. However, much of the natural musicality we associate with music from the 1960s and 1970s arises from the fact that it wasn't recorded to a click, and that the musicians, who were probably playing as a group rather than endlessly overdubbing individual parts, were subconsciously and naturally varying the tempo throughout each number. Sequencers such as DP, by dint of their built-in click tracks and bar-and-beat time rulers, can tend to steer users into going down the 'mechanical' route, but it doesn't have to be like this. By using DP 's Conductor Track — a special track that shows up in every DP sequence and can't be deleted — you can dial in as many tempo changes as you need over the course of a sequence. In DP 's main transport control window — the Control Panel — fold out the Tempo Control pane by clicking the triangle at the top right, next to the main counter. Tempo control in new sequences defaults to Tempo Slider, so switch this over to Conductor Track with the pop-up menu (see screenshot above). 1. Make sure your main counter is displaying bars and beats. If it's not, hit Apple-Alt-T to bring up the Time Formats window, and switch to 'Measures'. 2. Double-click the track name 'Conductor Track' in the Tracks Window. 3. Depending on your preferences, either the Graphic Editor or Event List window will open. If you get the Graphic Editor, click its mini-menu button (second from left in its title bar) and select Event List. 4. In the Event List window, click the title-bar's 'I' button (which stands for 'Insert') and choose Tempo Change. 5. DP brings up a new tempo-change event in the list, ready to be configured. You can specify location, beat 'type' and tempo. So if you wanted a tempo of 132bpm, for example, where the beat type is your basic crotchet (quarter note), at the beginning of your sequence, you'd type 1, 1, 0 (referring to the bar, beat and tick position, with a press of the Tab key after each number), select crotchet, hit Tab again, then type in 132. Finally, enter the data by hitting Return. 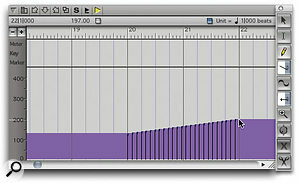 Entering tempo data in the MIDI Graphic Editor window, with the Tools palette 'docked' on its right. Note the location and tempo information at the top left of the window. This constantly updates as you move the mouse pointer, allowing a high degree of accuracy if you're working graphically.With just this simple method you can try out a few ideas, such as setting start tempo, nudging up the tempo of choruses, or gradually increasing tempo over the course of a sequence, to subtly manipulate the mood and feel of the piece. 1. With the Event List you opened above still open, choose 'MIDI Graphic Editor' from the window's mini-menu. (There might be one open if you're using the Consolidated Window view.) You can normally also get there just by clicking the Conductor Track track name in the Tracks window. 2. Scroll to the point in your sequence where you want to write the tempo data. 3. Hold down the 'P' key to select the pencil tool, then move your mouse into the tempo 'lane'. While you're holding down the 'P' key, your mouse moves on an X/Y axis, with location left to right and tempo up and down. There's an information bar above, which updates live to show the tempo you're about to enter and the location where it'll end up, so watch that for precise feedback (see bottom screen overleaf). 4. Click to enter the tempo data. This technique also works in the Sequence Editor, but make sure the Conductor Track's active layer is switched to 'Tempo', using the pop-up menu in the track information panel to the left (see screen on page 204). 1. Double-click the Conductor Track name in the Tracks window. If an Event List or the Sequence Editor appears, click its title-bar mini-menu and choose MIDI Graphic Editor. 2. Now scroll to the location in your sequence where you want to write the accelerando or ritardando. 3. If it's not already open, hit Shift-O to open the Tools palette. We could draw in a tempo change freehand with the Pencil tool, but there's a better way. From the 'Reshape Flavor' pop-up, select Straight Line, which ensures that the series of tempo events is smooth, rather than a wobbly line. Then make sure that the 'Reshape Action' pop-up menu is on 'Set'. The other options in this menu modify existing data rather than simply entering new data as you would expect. 4. Back in the Graphic Editor window, hold down the 'P' key, to select the pencil tool, and move your mouse to the location where you want to write the tempo change. Watching the information display beneath the window's title bar, move the mouse pointer to select the right tempo. 5. When you have the right location and tempo, click and hold, while dragging the mouse pointer to the location and tempo where you want your accelerando or ritardando to end. Then release the mouse button, and DP writes a series of tempo events to describe the accelerando or ritardando. Simply varying the 'Reshape Flavor' allows different types of tempo changes, from natural, gradual effects using the Parabola or Spline, to experimental madness using the periodic or random waveforms. If you ever need finer resolution for inputting tempo data graphically, just zoom in further, horizontally and vertically, on the Graphic Editor window. Aside from the extra instruments, DP 5 also boasts a range of new and improved features, and it's notable that none of them is in any way gimmicky — they all underpin, some very powerfully, the already professional nature of the application. Take, for example the redesigned input-monitoring scheme. Previously in DP, input-monitoring behaviour was closely tied to a track's record-enable status and the Audio Patch Thru option, and was further subject to some rather cryptic options hidden away in the Setup menu. Not any more. In DP 5, all audio tracks have an additional input-monitor button that allows (or not, depending on its setting) the track's input to be patched to its output independently of its record-enable status. This opens the way for audio tracks to behave much more like aux tracks and will be a real boon for anyone who regularly has to route MIDI sound modules into DP for mixing. You'll be able to use audio tracks for this (where previously you'd have needed aux tracks) and then record to them just by clicking their record-enable buttons. The control of monitoring during record, playback and punch-in is also rationalised. Another great enhancement is the new Meter Bridge. This is a window (which can also become part of the Consolidated Window) that brings together meters for all hardware inputs and outputs, busses, bundles and tracks. It's entirely user configurable, and you can decide whether it appears as one long meter 'strip' running from right to left across the screen, or whether the meters start to rack up in rows, allowing best use of screen area, especially on smaller monitors. This feature should be particularly handy for users whose audio hardware doesn't have front-panel metering. One of the most frequently requested features missing in previous version of DP, Track Folders, becomes a reality in DP 5. Track Folders are an important organisational improvement, whereby individual tracks can be grouped together into folders, or even folders within folders, potentially making extensive track lists much more manageable. For example, you could have individual folders for all your MIDI tracks, aux tracks and audio tracks, or perhaps use a single folder to keep an Instrument track and the MIDI track that drives it together in one place. Just as in one of the Finder's file lists, folders can be opened or closed with 'disclosure triangles'. Then there's a whole set of features related to clicks and count-offs. To start with, new click-track programming facilities are available, allowing sophisticated click 'maps' to be set up, independently of the Conductor Track if necessary. These features go hand-in-hand with some improvements to the Count-off feature, which is now more flexible and intelligent. Those working with music or audio for picture will benefit from major new features for superimposing streamers, punches and flutters — all visual timing and cueing aids used during scoring sessions — on Quicktime movies in DP 's Movie window. Previously, this often required expensive dedicated hardware, so it's a great development that should further enhance DP 's strong reputation in the field of music for picture. 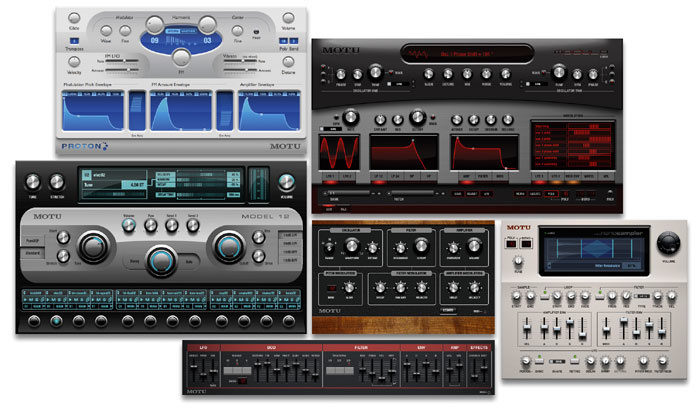 Smaller improvements include four new tools — Trim, Slip, Slide and Roll — for audio editing, soundbite-anchored volume automation (so-called 'bite volume'), a Waveform Editor that can be tied to the main transport and now allows more direct editing of tempo maps, and a new MIDI Devices tab in the Bundles window, which effectively does away with the need for Apple's Audio MIDI Setup application. Finally, there's a new MIDI Keys utility which allows you to play and enter MIDI data from your computer keyboard. MOTU suggest that this could be useful for when you're "in the back of the limousine", and this will doubtless be where I end up using it the most. DP 5 will apparently cost $795 to buy new, and although upgrade pricing hasn't been confirmed yet it's likely to be close to the $149 figure that has been in place for the last few major updates. When you work only with MIDI, the world is your oyster as regards tempo changes — you can write as many as you like and DP accommodates them by simply replaying MIDI events at different rates. But what happens if you end up wanting to sequence MIDI parts to a drum track that was recorded without reference to a click? Or if you want to build a MIDI arrangement around a finished track imported from a commercial CD, especially if its tempo varies? Clearly, writing tempo data as described above would be total guesswork, and could end up being a tortuous job. Fortunately, MOTU have this pretty much sussed and (as ever with DP) you have a number of methods at your disposal. The Sequence Editor can display the Conductor Track, but to enter tempo data you first need to select the Tempo 'layer'.The first is to use DP 's Tempo Analysis features, which I described in detail in April 2005's Performer Notes. Tempo Analysis relies on you having DP 4.5 or later. Your audio must also have undergone Beat Detection, and its beat structure must be fairly obvious. If everything's in your favour, you just need to select your 'tempo reference' soundbite and choose 'Adjust Sequence to Soundbite Tempo'. However, fate is rarely this kind — Tempo Analysis doesn't work well on full mixes or complex material, and is left high and dry if there are any sections of audio with anything like a 'drop', where all rhythmic features disappear for a while, leaving only sustained, smooth sounds. However, for all these situations and more there's a wonderfully simple and robust solution: Adjust Beats. 1. Create a new sequence and make sure its time rulers are displaying Measures and Beats. Then just record yourself counting from one to 10, or playing a series of, say, 10 chords on an audio track. For the sake of illustrating how Adjust Beats works, it's important to do this without reference to a click or DP 's measure and beat counter, and to drop into record for a couple of seconds before you make your first sound. To add interest, you might as well make your counting or chords pretty irregular. 2. Switch Tempo Control to the Conductor Track, using the Control Panel, as described earlier in this article. This is essential when using Adjust Beats — as DP will warn you, in fact, if you ever try to use it when Tempo Control is still set to Tempo Slider. 3. Have a listen to your track. Using Adjust Beats, you're painlessly going to get the beats in your audio to define the rhythmic structure of the Conductor Track, with the first count or chord becoming the first beat of a bar, and each subsequent count or chord becoming the beat that follows it. 4. 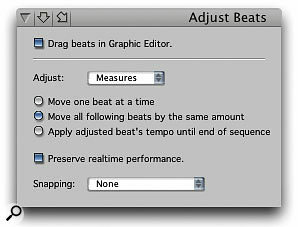 Bring up the Adjust Beats window, as described above, and check the 'Drag Beats in Graphic Editor' box. This simply turns the Adjust Beats function on. If you need to return to normal Graphic Editor or Sequence Editor editing behaviour, just uncheck this. Also select 'Measures' from the pop-up menu, 'Move one beat at a time', and 'Preserve realtime performance'. Snapping should be set to 'None'. 5. Open the Sequence Editor and scroll and zoom so that you can see the soundbite you just recorded, and the waveform peaks relating to your counts or chords. The Adjust Beats window, which allows you to visually drag beats in the time ruler, is a highly specialised way of entering Conductor Track tempo data. 6. Move your mouse pointer to Bar 2, Beat 1 in the time ruler and click and drag. You should see a grey vertical line appear through the time ruler and tracks at that point, to confirm the beat you're adjusting, and, as you drag left or right, a red vertical line showing the location where Bar 2, Beat 1 is about to be placed (see screen above). Drag this red line to the start of your first count or chord and release the mouse button. You should see your soundbite seem to change, and its first waveform peak line up with the Bar 2 downbeat. 7. Now, assuming that we're working in 4/4, drag Bar 3, Beat 1 to align with your fifth count or chord. If you recorded enough material, drag Bar 4, Beat 1 to align with your ninth count or chord. That's the measures dealt with. 8. Switch the Adjust Beat window's 'Adjust' pop-up menu to Beats. Drag Bar 2, Beat 2 to align with your second count or chord, Bar 2, Beat 3 with your third, and so on, until all your beats align with a count or chord. 9. Uncheck the 'Drag beats in Graphic Editor' box and play back your sequence. The appearance of the soundbite might have changed, but the audio remains exactly the same. Check the Conductor Track and you should find that DP has entered tempo changes to make the sequence's bars and beats align perfectly with your audio. In this example, you'll notice I suggest first aligning Bar 2, Beat 1. This is because the very first beat of a sequence — normally Bar 1, Beat 1 — can't be adjusted. So it's better to start with Bar 2 or simply edit your soundbite and place it at the beginning of the track, so that Bar 1, Beat 1 doesn't need adjusting. Always work from left to right through a song. Always start by adjusting measures first, and then going back and adjusting beats between them. 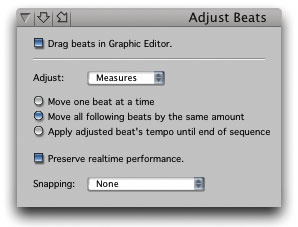 Using the 'Apply adjusted beat's tempo until end of sequence' option can make adjusting long sequences much quicker. 'Move one beat at a time' is good for when you've adjusted your measures and you need to go back to adjust beats between measures, as the subsequent beats are not affected. At the bottom of the Adjust Beats window, the Snapping pop-up menu allows dragged beats to snap to Notes or Audio Beats, Markers, or nothing at all (None). If you're adjusting beats to audio that has been beat-analysed, choosing the 'Audio Beats' option can be a tremendous help, as it takes the guesswork out of finding the exact location of important transients. Adjust Beats is being used to align the bars and beats in DP's Conductor Track with the bars and beats of an audio recording that has variable tempo.What if the beat structure of your audio is very unclear, is literally riddled with beats, or has no beats at all? In these cases, and in other cases where the on-screen waveform gives you no help in dragging beats to the right location, you can try this nifty solution, which uses MIDI notes to help define the rhythmic structure of the audio. 1. Create a MIDI track and set its output to None, but record-enable it. 2. Hit record, and as your audio track plays back, tap your MIDI controller keyboard (any note) in time with the music. 3. Go back to the beginning of the sequence and start adjusting beats, as described above, but use the 'Notes or Audio Beats' snapping option. As long as you can see the MIDI notes you just recorded, it should now be easy to snap your beats to the beginning of these notes. The result should be a tempo track that plays well in time with your audio. As well as assisting in Conductor Track beat-matching, Adjust Beats is also central to some more advanced techniques, which border on the 'liquid audio' concept used in certain other applications (such as Ableton's Live). We'll be looking at some of these ideas next month.